Aya HaidarAya Haidar was one of 30 participants from Europe and beyond who took part in the Team Syntegrity – or non-hierarchical conference – held in Barcelona on 18-22 June 2017. This is part of a series of follow-up conversations on that event's themes, recommendations and relationships. Aya Haidar (Aya): I’m sorry about the delayed start. I’m in Scotland in this tiny town on an arts residency and I was getting ready to speak to you guys when I get a call from one of the ladies who works in our office. She went to the train station to drop someone off and saw these two Arab-looking men wandering around lost. (This is an incredibly white part of the world.) The older one looked unwell and partially disabled, the other just lost. No-one speaks Arabic so she took them back home and rang me up to ask me to translate. Anyway they come from another town maybe an hour and a half away, because they found an advert for a mobility scooter for sale on Facebook. They came on the offchance, but they only have a postcode and they are lost. It’s freezing, it’s raining and they only have these crappy, flimsy little jackets. I tried to understand. The guy said, “Look my Dad is unwell. He has heart problems, and we have to be back where we live at 5pm for a doctor’s appointment. My mum is having an operation…”– they haven’t eaten, the list is endless! 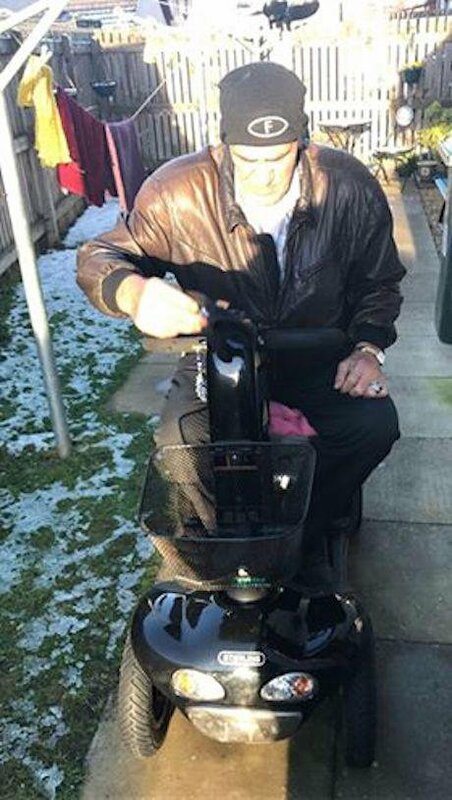 The scooter is for his father because he can’t walk, yet he has been traipsing over here in the rain to get it and is clearly on his last legs. It costs £600, which is literally all the money they have and turns out to be in another town one hour away and the trains are so infrequent. But this amazing woman in our office has a van and says, “Take my van. I’ll walk home. Just get them there.” The van is perfect because fitted out for a wheelchair. And we find someone to take them to pick up the scooter and get them home. So that’s why I was late. The motor scooter!Rosemary Bechler (RB): Does that sort of thing happen every day, Aya? Aya: Pretty much. One hundred Syrian refugees have come into this area, but there are very few resources for them. No-one speaks Arabic. I am the first Arab-speaker that they have encountered here, and it is just a fluke that I took on this project! RB: Well actually that dovetails rather well into what we were hoping to talk to you about, Aya, which was the Safe Spaces discussion you took part in last June in Barcelona. More specifically, the distinction that arose in your group between safe spaces which seek to reassure one cultural grouping, like a US student sorority house for example, and safe spaces bringing people together from different backgrounds to resolve their differences and negotiate a better way of living together? Has that proved to be an important distinction in your work as an artist? Aya: It was Sunny Hundal I think who made that really good point that you can be trying to create a safe space by targeting one group and preserving the culture within it, but the danger is just excluding everyone else – so what is safe about that? But where I was coming from in that discussion was how important it is nowadays in our societies to create a space where people with a common interest can come together and anything can be voiced and anything can be shared. As an artist, what prompted that thought was my sense that, like a lot of artists, there is a lot I don’t know about how to make a living out of this career in the arts. 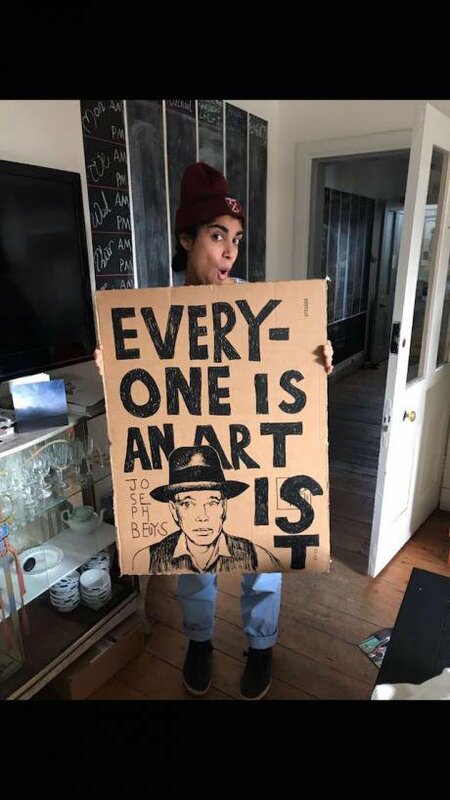 That is not something that you are taught at art school. Creating a space where information can be shared and opportunities are transparent could be very useful. 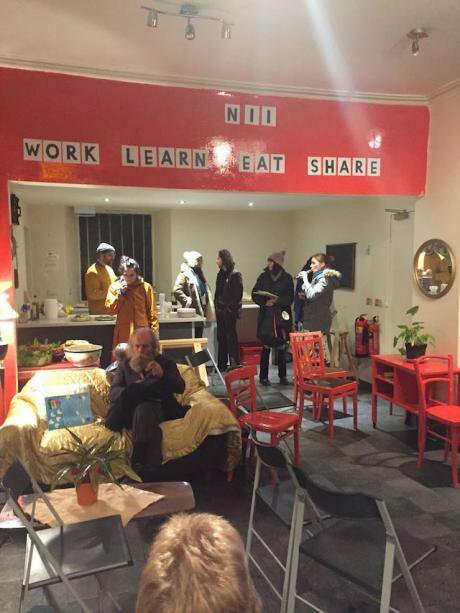 A network of artists is really important, for example, especially for community projects where you are trying to tap into different needs and skill sets. Having lived in places like Saudi Arabia where I worked for two years, where open dialogue is non-existent, and if you are outed as gay your life is immediately at risk, seeing that there are other people in the same boat as you allows you to breed strength in numbers, and movement can happen. LGBT rights, mixing of gender in one communal space, certain forms of artistic expression or even freedom of written expression in some countries – these things are taboo in some parts of the Middle East. If you are gay, or a woman or a minority fighting for labour rights – whatever it is –and you have an underground movement like that, where people can talk about how they feel, in a space you have created where you are socially accepted, then something is born, a seed is planted. And I believe that this is a really strong way forward for any kind of change to happen in society. In our discussion, I insisted that these movements have to be completely separate from the state. They rely on people in society rather than any kind of facilitator ‘from above’. RB: So was it important for you that the Team Syntegrity process also centrally relies on the self-organisation of groups of people? Aya: Absolutely, and what I found really interesting was how every single person in that whole group was different from the others. You had a group of artists, sure, but representing very different realms of the creative industries – experts in the spoken word, or theatre, or painting, or weaving. But then you also had people who worked in finance, scientists, politicians, including some people who I felt were part of the problem, all advocating from different vantage-points in society, really multilateral, top down, bottom up. Aya at Team Syntegrity 2017. openDemocracy/Cameron Thibos.So there was lots of intense discussion and I really liked the fact that none of it was ‘facilitated’ by anyone – it was us and very much owned by the people taking part in that discussion, who themselves flipped or jumped between the different roles of ‘critic’, the people talking and the people who were just listening. You wore different hats and you had your own input, even in subjects that had been chosen seemingly out of the blue, where initially I thought, “I’m in no position to say anything on this.” But as the process unfolded, I began to feel that actually my position on this was just as valid as the people whose whole career had probably been spent working on that. There was a very level playing field for everyone in a way, and I thought that was really, really important. RB: When you wrote to us after the event, you said that you had, “3 international exhibitions coming up and all have a basis around what was discussed during the forum.” Tell us more! Aya: One just finished at the Athr gallery in November in the Abu Dhabi Art Fair, and I have two coming up in February. One of them is in Saudi Arabia, curated by the assistant curator of Tate Modern, Vassilis Oikonomopoulos: and the other by an amazing curator, Maya El-Khalil, again in Jeddah. All of these I would say are very political shows in parts of the world where they are not allowed to be political. RB: So these too are safe, creative spaces in a way, and maybe places where art can do things that politics couldn’t? Aya: Absolutely. For me, in these exhibitions, it is not as if you are allowed to say whatever you want, but, for example, for Vassilis and the Jeddah artweek, 21.39, I’m making a work around labour rights in Saudi Arabia. There are so many issues I would love to explore in Saudi Arabia, women’s rights for sure, border politics and the wide geopolitics of the region. But something that struck me so forcibly when I was living there was the lack of minority rights and lack of voice – for Bangladeshi, Pakistani, Indian, Filipino people living in that country. And then there is the pecking order based on ethnicity. I am interested in the value that we put on art, and also the value that we put on labour. So I am collaborating very closely with a Pakistani embroiderer who works locally in Saudi Arabia. And I have developed a work contract with him where he sets the terms. And these are very humane terms. For example, “ Can you please refer to me by my own name which is Alamdar and not Sadiq”, a racist generic term often applied to people of Pakistani or Indian origin. We negotiated his salary and that is in the contract. Having 24-hour access to electricity to maintain an air-conditioned working space, in contrast to the incredibly inhumane conditions of so many sweatshops there. Being able to attend the VIP preview of the exhibition – the people who do the labour are never ever seen. They are always behind closed doors! So this is a set of clauses in a written contract that we have signed, and it will be translated into urdu – his native language – and his job then is to hand embroider this actual contract in black thread onto white cotton. Next, I am designing the pattern for the border around it, so that this embroidered tapestry of the social contract between me and this migrant labourer, will constitute our exhibit. It speaks directly to the value of art, since if he is earning x amount, and I am selling it for y amount – then why is it that the value of the artist is so much higher than the labourer? Or why is it that you are OK buying the work for three times that amount because I have got my name on it? The piece humanises this person who is otherwise completely dehumanised, and it is a really interesting negotiation in a country where contracts don’t really exist between migrant labourers and their employers! Also it subverts the usual hierarchy: it is very much him putting down his list of demands – something you’d never normally see. So it challenges quite a lot of everyday assumptions. RB: Isn’t something rather extraordinary happening here with gender and class roles? Aya: The men of course generally do have the upper hand in that society. But yes, obviously in this case it broke a lot of rules, in that I was in close confines with him, meeting him, sitting, talking to him, documenting what he said and trying to understand him and learn more about his family background and so forth. At first, he was obviously thinking, “What the hell is this?” But once I broke down the barriers, conversation flowed and I learned a lot about him having this little chat. But legally in that country I would not be able to be in that room alone with a man not related/married to me. RB: So you really had to create a safe space, through your art, to be able to do that. Aya: Yes. With this art work we had to create that safe space where it was allowed, to take that control back to ourselves. Maya El-Khalil, meanwhile, is looking at society in the region, and how the narratives of politics and the media, the ‘news’, affect our daily lives and futures. Did you see Wolfgang Tillmans’ summer exhibition in the Tate Modern… where there was one particularly fascinating table installation, the ‘Truth Study Centre’, covered with the images and debris of all sides of the Brexit propaganda. They showed how easily pulled and swayed we are by these stories that surround us in society. She is interested in that: in story-telling that shifts the narrative in societies. One of the works I am putting forward for that is specific to Saudi Arabia, where a ‘family tax’ was introduced by the government in July, which charges non-Saudis 100 riyal extra per dependent every month. Next year this will double and the year after triple. I have been collecting their narratives about the human cost of all this, hearing from men who say that their family is all that they have but they have had to send them away; or that their family is now reduced to eating only five days a week! These stories are not in the mainstream at all, but the mainstream is quite split over this. If you are queuing up for something and there are a lot of non-Saudis getting ahead of you in the line at school or whatever, that can be annoying. And of course non-Saudis should make a contribution to their society. But the general consensus I think is that the way that tax was brought in was not right, because it should have been done incrementally an as a proportion of someone’s wage, whereas now a road-sweeper is getting taxed exactly the same as someone who is earning millions at the head of a corporation. It’s unfair. So although I don’t feel it is my responsibility to offer a platform for the voiceless, I do think it is a massive injustice, and these voices are being completely stifled. Maybe no-one wants to know really. So I will print excerpts from these stories on small little rubber stamps screwed to the wall, and visitors to the gallery will have an opportunity to press these stamps carrying these extremely powerful one-liners that mean something because they came from people who are directly affected by what the human cost of this is, onto their own bank notes. So it reintroduces that human cost back into the financial system. A tiny act of infiltration and dissemination – seeing how far it can go. But I really believe in participatory work: that for people to have any ownership over some sort of change they need to participate in it. It’s illegal to deface bank notes so they don’t have to. Or they can stamp their hands, or a book, or the wall, or photograph them or do nothing at all. The messages will be in Arabic in tiny fonts, so very subtle on the banknotes. But it is up to them if they want to take that risk. Making that mark, that physical stamp though, creates the space for a bit of rebellion maybe, and people will be able to choose between five or six different stamps which quote they relate to most. Not just to glimpse this injustice, but to do something about it by diffusing an otherwise silenced voice. But the third and biggest piece of work that I’m doing for this show is heavily informed by this current arts residency I am working on, with the incredible Deveron Arts up in Huntly in Aberdeenshire in Scotland. 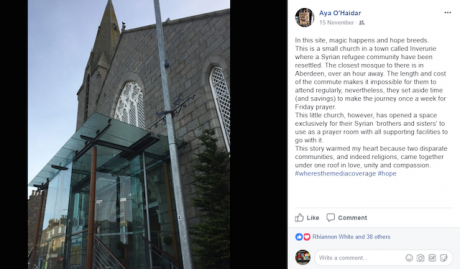 They received funding for a community arts project with the hundred Syrian refugees who have been introduced into five or six towns across Aberdeenshire. We are to develop a project that engages the marginalised members of the community, including these Syrian refugees and I am the only Arab speaker in the place. The Syrians are incredibly grateful for the way they have been taken care of: they are well-housed and receiving benefits. But although there are measures in place to help them learn English over time, it will take a lot of time. They were people chosen to come here because of the trauma they have undergone, and may be suffering physically and mentally. But there is no translation for counselling, and anyway, how can you feel part of a place if you are silenced indirectly in this way and can’t even talk to people? So I am creating a massive body of embroidery work by collecting the old, torn, battered shoes that they came here in when they fled from Syria in the clothes they were standing up in, and I will tell their stories that they can tell me and bring them into the light of day, by embroidering them on the soles of those shoes. Again, no-one it seems wants to hear these personal stories: we hear the number of people who died coming over by boat, or the number of migrants in our country. But actually, these people have names, and have lost something and they have their own fears and this is about humanising them, telling these stories that people don’t know, and will never fully know. But giving them a small glimpse into what has happened to them, and who they are. And this brings me to the residency itself. 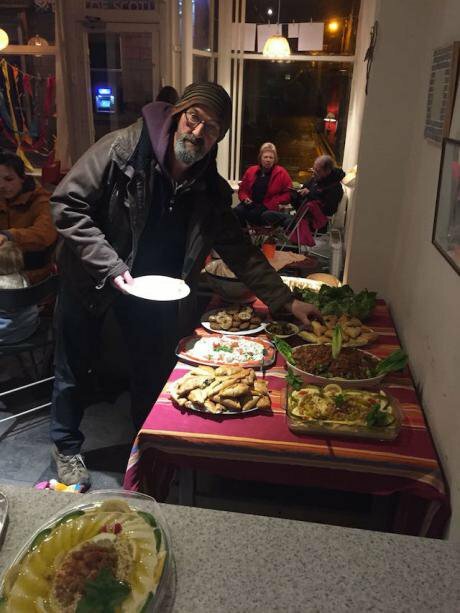 We have decided to focus this residency on a food programme, because it is such an amazing way to bring a community together, sharing a table, and in a way making an offering. You can learn a lot about culture, about heritage through food, and about identity, giving and generosity. Arabs show their love through their food and it says a lot about them. You can say so much without the verbal exchange which is such a challenge. RB: This reminds me of the poem about sharing ‘free food’ that Vanessa Kisuule wrote and performed for us in Barcelona. (4.22 – 6.00 mins.). Aya: It was indeed a very powerful poem. And you see, for me as a Muslim Arab woman, I am so tired of people identifying with where I am from only in terms of bombs, and wars and terrorist threats. I feel a deep pride in the integrity of our culture, the incredibly rich food culture of where I am from, the music, the architecture, literature, the language, the landscapes, all of it. And this is a feeling echoed by the communities we work with here. They say, “ Look, we don’t want pity from our host communities. We want them to see that we come from an incredibly diverse and rich part of the world.” But they can’t prove that except with their food. Because this they can make with their own hands, and really take it and place it in someone’s heart. Moreover, the fact is that when we talk about marginalised members of society here, the local Scottish community have a very poor relationship with food: it is all processed food, fast food, high sugar, high fat, high salt. There is a very high level of obesity. 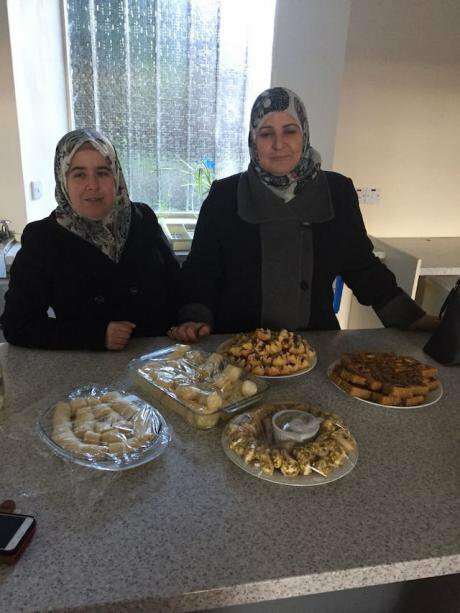 Whereas the local Syrian community, although they don’t have much, their food is very diverse and very healthy, and they cook everything from scratch. Nothing is bought pre-made. So we thought this would be such a good way to bring these two communities together, so that they could also share in the learning. Our Scottish community wouldn’t be the only people showing people the ropes, and maybe not getting that much back for themselves in the process. Instead it would be a two-way engagement. 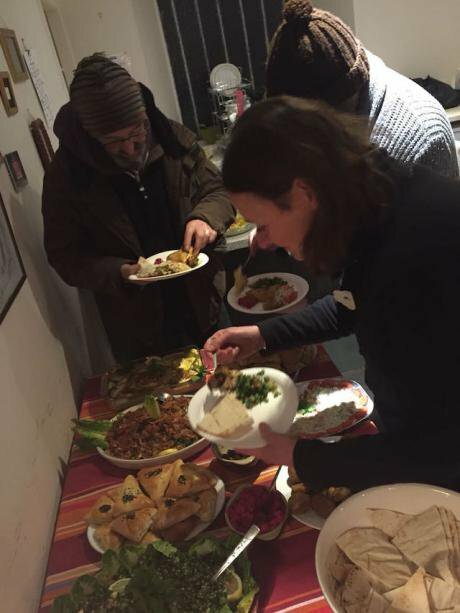 All the local people who have eaten this Syrian food have been completely amazed by it – floored by the sheer abundance of it and by the generosity involved. So food is really central to this project, I believe. Inverurie churchBut let me tell you about the church in Iverurie, a town a little larger than Huntly where there are maybe five or six Syrian families. There is only one mosque in Aberdeen which is over an hour away, and the expense of all the coming and going is too much for them. A lot of them volunteer in the church in Iverurie, with the washing up and the cleaning, or work in charity shops like Christian Aid. It is rather humbling. But the local church has been the same. 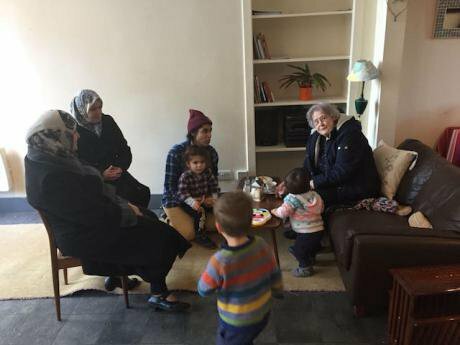 The Church has opened up a permanent space within it for these Muslim Syrians to worship and hold their own meetings, as well as the facilities Muslims need to wash themselves before they worship. All those who can’t travel meet up every week for Friday prayer and that brings them all together. They are so grateful. They say, “They have welcomed us into their home, into their church, into their community.” They are full of praise, especially for the acceptance and for the trust. For them, it reinforces what is written in the Quran about all people in the world being brothers and sisters under one God. And a lot of them feel terrible about being on benefits. They say, “We are able-bodied but we can’t work because we don’t speak the language” and they are trying hard to learn English so that they can make a contribution in return. So you can see that in Iverurie, there is such a beautiful brotherhood of friendship in that community, which is so very different from what I read about in the news. There reality isn’t that, but instead such an open door mentality where Syrians have been welcomed. 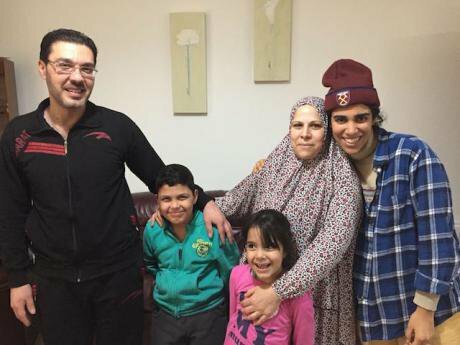 They tell me neighbours will knock on the door to make sure they are OK when they first arrive, and then the Syrians bring them food, and they wave and say hello and are very patient with these new arrivals they don’t understand as well, and there is this sense of warmth and acceptance. Acceptance I think is the big thing for them. A lot of this will inform my artwork for the foreseeable future, well beyond the exhibitions. There is a lot here and I am constantly documenting what is happening, trying to sit with it and make sense of it all. I’m on this residency on my own with my two young kids, so it is pretty manic till 7pm when thy go to bed. At night is when I can really work. Aya: We have been thinking that we would like writers to come and maybe help us make up a little book where these stories could be told firsthand or maybe make up a newspaper – they do need to be told and shared. RB: When we contacted you it was prompted by your tweet on the safe space opened up by Inverurie church – we thought that was a perfect image for our follow-up. But in fact, as we now learn, as an activist and an artist, your work has also been creating a series of safe spaces, and maybe you have saved one of your very favourite examples to talk about last? Aya: Yes, the main aim of this project is the space that we have hired. It is called Number 11, as it is located at Number 11 Gordon Street in Huntly! It is a multifaceted space – our office, a café, a community center, an indoor garden, a classroom… .What it is in fact is an amazing, multifaceted space which contains the office we will be working from, but also a language class, a performance space and a café, with the help of our Syrian friends, that serves food and coffee to people at all times, to encourage members of the local community to come and share. 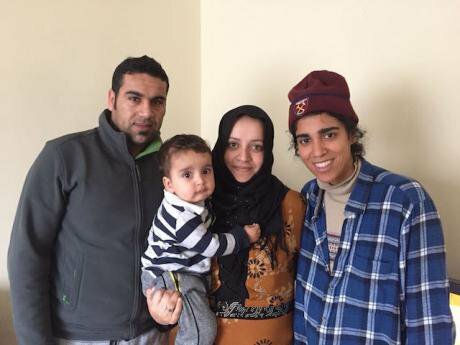 When I say local members of marginalised communities, I don’t just mean refugees or poor people, but I also include mothers – Scottish mothers with young kids, and Syrian mothers who can’t go out to work and would otherwise be keeping their kids indoors. We have a little box of toys for the kids, so that these mothers can get together in this space. We can, for example, close the shop and have a breast-feeding session where Syrian mothers can sit and talk to Scottish mothers who are also having problems breast-feeding. We feel we are changing some of the models of ‘integration’ with our work. For example, it is great that the Council put on language courses for the Syrians, but those courses are not that good for putting language into practise. What we do is run ‘language in the wild ‘ sessions, where we take our Syrians on trips to the pharmacy or the supermarket, introducing them into the contexts most relevant to them. It is also a space where local people can come and share their grievances and they might say, “Well why are these people here?” And we say, “Well this is why they are here. You know what, the coffee that you are drinking was made by Hayat over there who also has three children, and who made this journey…” And this puts a face to the name and can break down any barriers that are bound to be there, say with the older members of a community for whom this is an encroachment into their town. 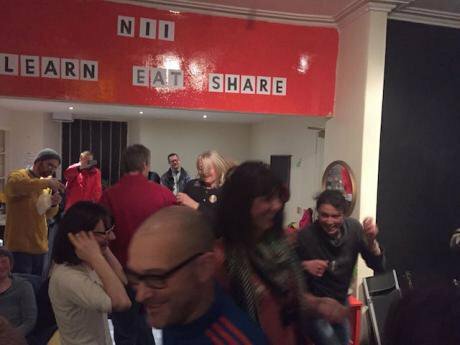 We are all leftwing maybe in Deveron arts, but we asked ourselves – what about the others? So why don’t we literally invite them into our shop, and say, “Come and have a cup of tea and a baklava and share this culture first hand.” Especially after going out on my field research and listening to what all these communities want, I’m really excited about it. I believe that is what this amazing space is going to be able to do. Last night we had this huge event called ‘Practices of Peace’ put on by Deveron in this space. 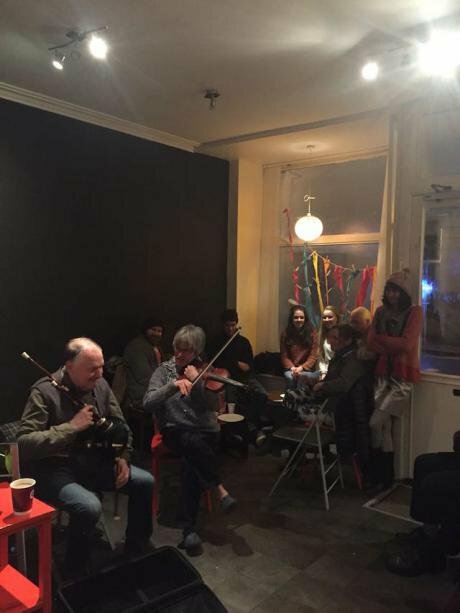 I posted something on Instagram, because the Syrians cooked Arabic food, which was delicious, and the local Scottish people were there and we had this ceilidh. 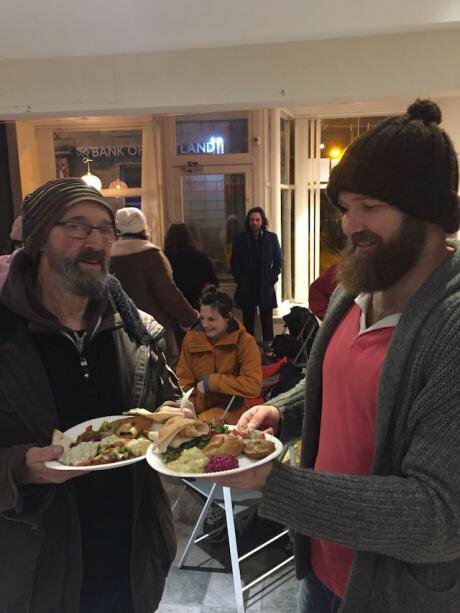 So there was music and dancing and the bagpipes, as they were all tucking into houmous! It was just beautiful to see these two very disparate communities and cultures coming together in this space. In the daytime, we all sit at this large round table: with local writers who have dropped in, or local mums wanting to send a quick email, sitting with us who are trying to develop this project and Syrians who want to practise their English, with children playing around, old people, alcoholics, the homeless. All sharing at the same table. 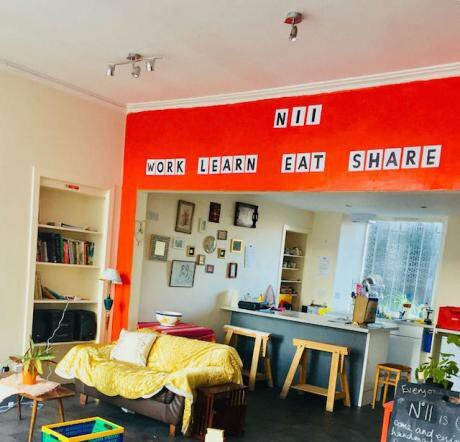 It is all donation-based, so if a homeless person round the corner wants a cup of tea and can only afford ten pence or nothing, she or he can have that. If someone wants to donate a tenner, he can. It is all about inclusion. We are not barring anyone based on gender, colour, race, religion, money – anything. So it is just this open space which doesn’t exist anywhere else in this Tory stronghold where people are set in their ways and everything closes at 4pm and opens at 10 am, and everyone is white and they like their routine. We are open from 9am to 10pm every day including the week-ends. The first thing we did when we moved in here was to strip the disgusting wallpaper, and paint the whole of one wall in this amazing space black. So we are all occupied at this massive chalk board: I’m up there doing the planning for the week, and my two sons are sitting a bit lower down drawing with the chalk, and you have Syrians trying to translate something elsewhere on the board. So everyone is using the huge chalkboard, and it is just incredibly engaging and fun. I can’t rate it highly enough. For me this is the safe space I was talking about. It is a totally open space that people can feel safe in, because stories are shared, discussion is encouraged, barriers are broken and everyone is welcome. That inclusion is key! Apart from Team Syntegrity 2017, all the photographs are of Aya's Huntly arts residency.